“This is a dynamic time in South Florida. Recently completed developments and projects in the pipeline are not only changing the skyline, but changing the way people work, live and commute,” explained Brian Bilzin, Founding Partner of Bilzin Sumberg, as he kicked off Bilzin Sumberg’s inaugural South Florida Redevelopment Conference last month. The firm hosted a series of panel discussions featuring many of the region’s leading experts and influencers in development and land use. The result was a market-wide ‘meeting of the minds’ that tackled timely topics within the real estate landscape, from resiliency and transit, to inbound investment and public-private partnerships. Our professional services team was on hand for the conference, and we’ve captured some of the most thoughtful observations and exchanges from throughout the day. From the explosion of public-private partnerships to innovative transit-oriented development, South Florida’s growth over the past 10 years has been impressive. Migration from states like California and New York, coupled with an influx of foreign investment from countries as far away as China, have proven exponentially beneficial to the city and its growth, according to Mayor Francis Suarez of the City of Miami. The next chapter in Miami’s growth will likely focus on emerging neighborhoods, which have caught the attention of developers and elected officials alike. The up-and-coming neighborhoods are Little Haiti, Little River, Allapattah, and Liberty City, to name a few. As South Florida grows, so does its infrastructure needs. One way to accommodate those needs is through public-private partnerships which bridge the gap between the public and private sectors to help fund critical projects and bring them to fruition. “The two functions used to be separate, but now we are seeing P3 developments molded with commercial development, which is a really unique aspect,” said Michael C. Brown, Executive Vice President of Skanska, USA. Bilzin Sumberg is engaged in several P3 matters. In 2017, the firm facilitated more than $4 billion in proposed public-private infrastructure investments, bringing new opportunities for transit, housing, and public works. “When it comes to P3s, developers have to understand the communities they are developing in, and how their project can intersect with public policy aims of that community,” says Al Dotson, Managing Partner-Elect of Bilzin Sumberg and a specialist in public-private partnerships. Dotson pointed to the Drivers Club Miami project as an example. The 160-acre development put social services on-site, new infrastructure in place, and maximized existing infrastructure. To meet the developer’s philanthropic objectives and the needs of the community, Bilzin Sumberg also negotiated several community benefits with Miami-Dade County officials, community groups, and area institutions. These include a vocational training program for the Dade County School Board, an internship and fundraising program for Florida Memorial University, a public bicycle course, a community recreation center, and a government office building. “When evaluating its properties, governments are not only looking at the dollar for dollar value of the land, but what they want to bring to the community,” added Jose Galan, Assistant Director, Internal Services Department, of Miami-Dade County. The future of a more mobile and livable Miami is upon us. Javier F. Aviñó, Partner and Practice Group Leader in Bilzin Sumberg’s Land Development & Government Relations Group, used Brightline as an example, saying: “It took a lot of creativity and out-of-the-box thinking to meet the time frames necessary to make Brightline a reality.” Today, Brightline is the only privately-owned and operated intercity passenger rail system in the United States, with current service between Miami and West Palm Beach and a single intermediate stop in Fort Lauderdale. It’s a transportation game-changer in South Florida. Additionally, there are other transformative projects, like the Underline and the Brickell City Centre, already delivering full transit integration. Grass River Property’s newest development is Grove Central, which will be a transit-oriented, mixed-use development atop a five-acre site at the Coconut Grove Metrorail Station. The project will comprise a 330-unit apartment building, 180,000 square feet of office space, 40,000 square feet of retail, 180 key hotel, 850-space parking garage, and a covered bus station linked to The Underline. Additionally, Swire Properties’ Brickell City Centre is another great example of transit-oriented development where the developers integrated the project into the Metromover light rail system. Kieran Bowers, President of Swire Properties, noted that the integration is part of their “design DNA,” where they made sure to renovate the station and add a design element. Brickell City Centre’s shopping complex is anchored by two residential towers, a hotel, and two mid-rise office towers. After all, “With more than 550,000 people expected to come to South Florida in the next 5 years, the only way to build is up,” added Alan Ojeda, CEO of Rilea Group. 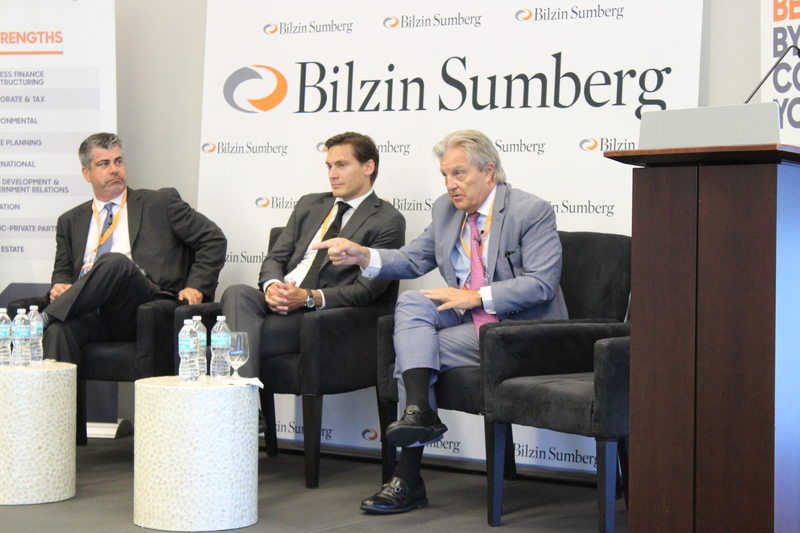 For more information and video highlights from the Bilzin Sumberg South Florida Redevelopment Conference, check out Bilzin Sumberg’s New Miami Blog.